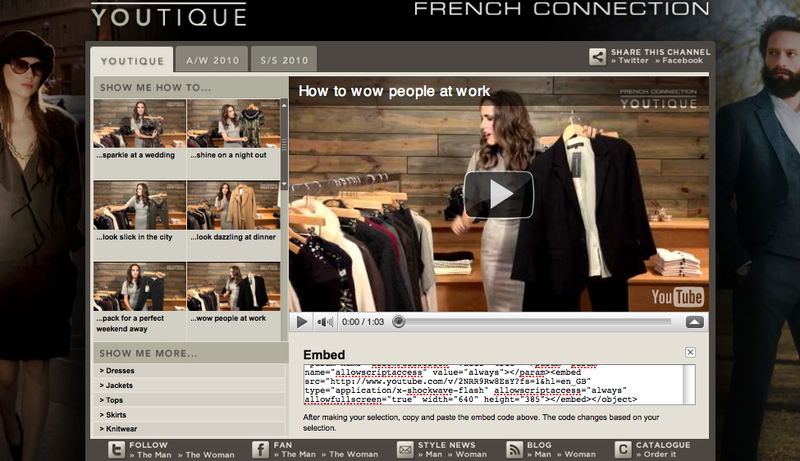 The recent launch of French Connection UK’s (FCUK) v-commerce offering “YouTique” represents a very powerful opportunity for luxury retailers to mass broadcast style guide thought leadership and further strengthen loyalists’ affinity for brands. What is particularly compelling about this approach (although not currently leveraged by FCUK) is the mobile commerce implication. Experience has shown us the inherent value of video content over long-form text from the perspective of a powerful mobile use case. Through the production of this editorial style guide content that focuses less on particular pieces in an apparel brand’s collection and gives more emphasis on how best to apply the pieces to everyday events, FCUK’s “YouTique” offering provides utility, entertainment, and education as key drivers of increased brand loyalty. I was very honored to speak at the recent Luxury Institute event at The London Hotel in New York City on the topic of Mobile 2.0 and how luxury brands can leverage mobile rich applications as facilitators of the brands’ clienteling initiatives. While the topic of my presentation focused more on the potential positive implications of rich apps for enhancing the customer in-store experience, I urged the brands in attendance, including Louis Vuitton, Burberry, Moet Hennessy, Tiffany & Co., among others to create mobile moments that are in keeping with the essence of the brand and the customer experience that is at the core of what defines them luxurious. For a heavily lifestyle-driven brand like FCUK, the “YouTique” offering accomplishes exactly that goal of providing utility to its brand fanatics while remaining true to the essence of their brand. To embed this type utility with the framework of a robust mobile rich application is a goal all luxury apparel brands should aspire to deliver for these fanatics to further increase brand loyalty. This merits a brief discussion on the advantages of rich applications over mobile web as it pertains to providing a deeper level of engagement with brand advocates and peripheral shoppers. The mindset of the typical mobile web shopper and rich application shopper is entirely different in focus. The mobile web shopper is very utilitarian by nature, wanting to find a mobile-optimized site offered by a retailer, search for what they are looking for, and proceed through the checkout path as efficiently and quickly as possible, given the time-sensitivity of the engagement. The rich application shopper, we can conclude, feels a deeper sense of affinity with the brand in question, given the act of downloading the app to their device, and looks for the brand’s guidance as style guide experts. Thus, the rich application shopper is more engaged by nature and is the prime target for this “YouTique” concept. Fundamentally, the point here being that there are two primary use cases that retailers need to solve for to create a truly comprehensive mobile strategy. First, retailers must solve for the “busy” use case, which is solved well by an efficiently designed mobile web site. The second use case to solve for in a comprehensive mobile strategy is solving for the “engaged” shopper. This is best accomplished through a well-thought rich application strategy that incorporates the type of style guide content so perfectly exemplified by the “YouTique” example. The shopper that takes the time to download an iPhone app, for example, is a shopper who again feels that deep level of affinity with the brand and, as such, will tend to produce higher average order values (AOV) and increased frequency of purchase. The FCUK “YouTique” offering represents a tremendous rich application solution for mobile customers. The deep level of engagement garnered by the brand further increases their position as style guide experts for their legion of loyalists, with over 375,000 total upload views since its launch in April. I expect to see this concept trend considerably upward, especially given the ubiquity of YouTube as a broadcast medium to bring style guide and lookbook content to life, with full transactional capability.